Here’s a view of the high-rise apartment building (marked with “A”) that I’m located at in Chicago. The picture looks a little grainy because it was a taken about a mile away from the top of the Sears Tower, the tallest building in Chicago and the USA! 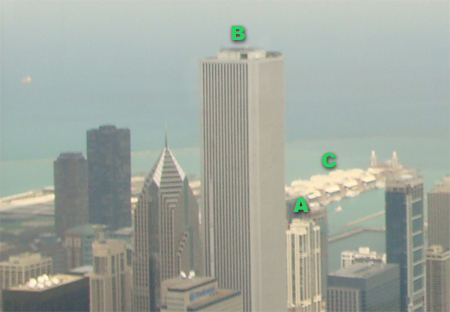 The building marked “B” is the AON Center, which the 2nd tallest building in Chicago. It is also the 3rd tallest building in the USA, behind the Empire State Building, which is the 2nd tallest. The area marked “C” is the famous Navy Pier on Lake Michigan. Although the BB 8830 has a slot for a SIM card, you only need to use the SIM Card to utilize the “world phone” capabilities like making/receiving phone calls and sending/receiving e-mails while you are in another country. If you are in the USA, the SIM card is not required. The one time cost of the SIM card is around $40. Another catch is that the phone is locked, meaning that you cannot use another SIM from another mobile carrier either from USA or an international carrier. This is a bummer because when I do go to China, I use a SIM card from China Mobile, so the local phone calls are about $0.05/minute. If I use the VZW Sim Card, the phone calls will cost about $0.60/minute. Whoa! Furthermore, in order to use the “world phone” in another country aside from the USA, you will need to pay an additional $14/month for the international phone + e-mail service. This is on top of the unlimited data service that I’m already paying for, which is $30/month. So now I’m debating whether or not to get the BB 8830 now, or just wait until November of this year when my 2-year anniversary with my current Treo 700w is up. If I wait, I can get an additional $100 off the phone price, from their “New Every 2” plan. Right now, the retail phone price of the BB 8830 is $399, and there is current mail-in rebate promotion of $100 off. This picture was taken from our 39th floor, high-rise apartment in downtown Chicago, in February 2007. It got very cold during this period – on this day, it was -20 °F. Did you read that correctly? That’s MINUS TWENTY DEGREES FAHRENHEIT. It was quite a climate shocker for a home-grown, Southern California boy like me, who is used to 72 °F and sunny weather. I’ll take the Santa Ana winds over this Chicago weather insanity, anytime. What you are seeing is Lake Michican, which is basically covered in about a foot of snow. I was told The Lake won’t completely freeze through, just at the edges. The street below is Lakeshore Drive. The building on the left is another high-rise apartment building under construction. Just a few months ago, we had an unobstructed view of the Navy Pier, but now it’s gone forever.